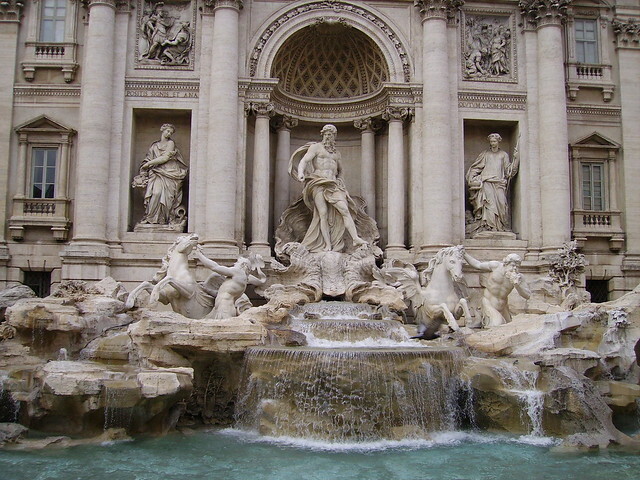 I’ve visited many cities in my time and Rome comes in as one of personal favourites- ancient, fascinating and vibrant. While the city can certainly help you relieve you of your cash in style, it’s also very accessible to the budget traveller. Rome is one of those cities where it would take a life time to see everything. There’s history and culture quite literally on every corner. Still, if you are backpacking round Europe Rome will certainly be on your itinerary and you’ll be asking where to start… If you’ve got a few days or even a week, here are your must see and do’s. 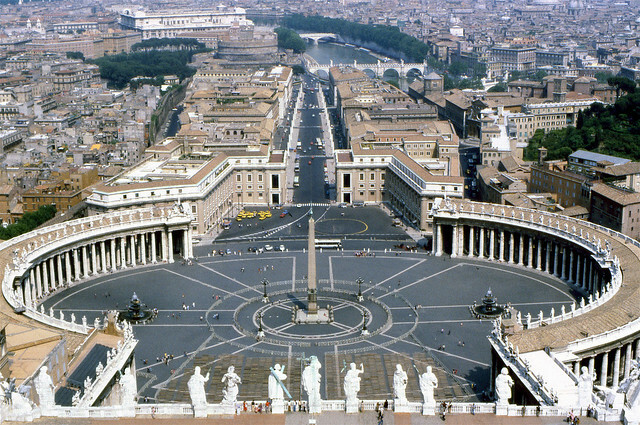 Even for those intrepid travellers who usually eschew the guided tour, Vatican City is one place I would definitely recommend it. 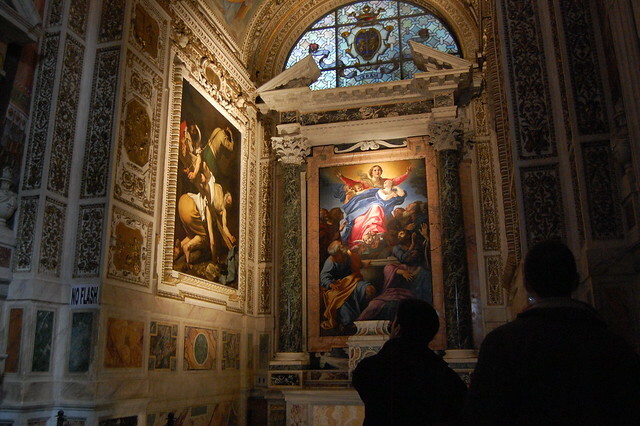 There’s so much to see and without the help of someone familiar with its wonders, you may not fully appreciate the extent of one of the world’s most important art collections, especially in the Vatican museums. 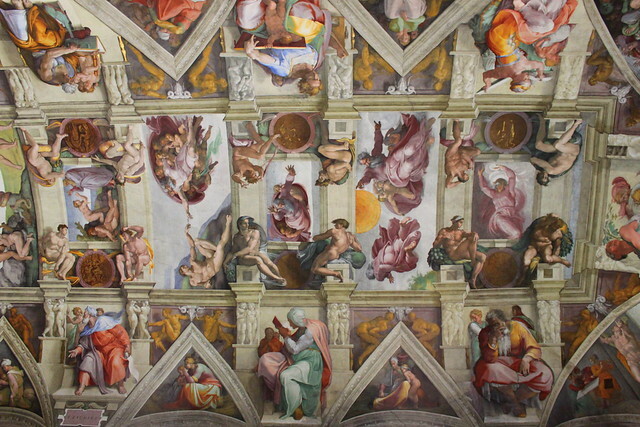 Of course the highlight of this tour is to behold one of the world’s greatest masterpieces: the ceiling of the Sistine Chapel by Michelangelo. I would urge you not to be the visitor who talks loudly or starts taking photos with massive flash (or better yet, suggests to your husband that it would make a great ceiling decoration for your bedroom at home). Have some respect! You certainly won’t be disappointed standing under Michelangelo’s dome, at the heart of centuries of faith. With a mixture of renaissance and baroque influences the interior is a marvel to see and the intricacy and workmanship will leave you in awe. The highlight of a visit to St Peter’s is a climb to the dome. That picture you always see on those postcards? That’s where it is taken! Fantastic views across Rome and not a terribly difficult climb. The last leg in the dome where you are walking at an angle can be slightly awkward but manageable nonetheless. And worth it! Approaching 2000 years old, the Colosseum is Rome’s greatest amphitheatre. You will shake your head at the fact that parts of this amazing structure were plundered to be used in other buildings. Nevertheless, even in it’s ruined state it is still an impressive sight, particularly at night when it’s dramatically lit. 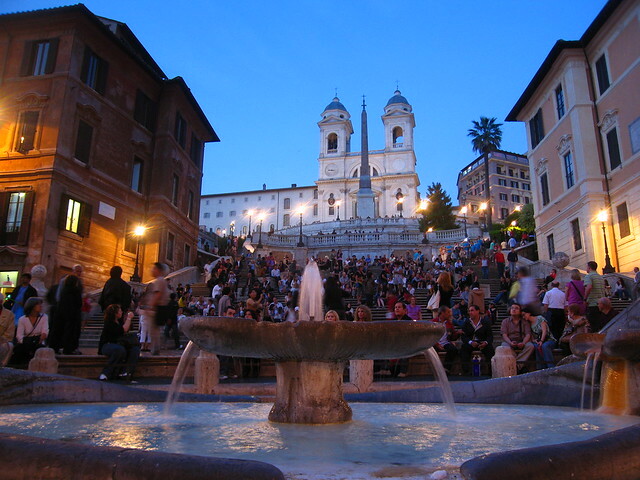 A distinctive landmark in the city, the Spanish steps is a great place to chill, day or night, and take in the ambience and style of the city. Spread throughout this area you’ll find buskers and sometimes a few artists. At night particularly by Fontana della Barcaccia (the fountain at the bottom of the steps) it’s pretty active and a great place to people watch. A marvel of Roman engineering, turned church, the Pantheon boasts an impressive Dome with an Oculus (hole in the roof) providing the only source of light. Art history buffs will feel like they’ve stepped straight out of a textbook and even those less artily-inclined will appreciate the tomb of one of the great painters of the renaissance, Raphael. This church is an impressive collection of artistic treasures- including two Caravaggio masterpieces and works by Raphael and Bernini. If you have ever read Angels and Demons, this church is where one of the scenes is set! I actually took my copy of the book with me. Was interesting to read the passage, particularly the explanations of the various symbolism and imagery. The Forum, in its youth, was the power centre of the great city of Rome- the commercial, judicial and political centre of the Roman Empire. I couldn’t even begin to elaborate on the various temples and basilicas to be seen here, but you certainly won’t be disappointed. 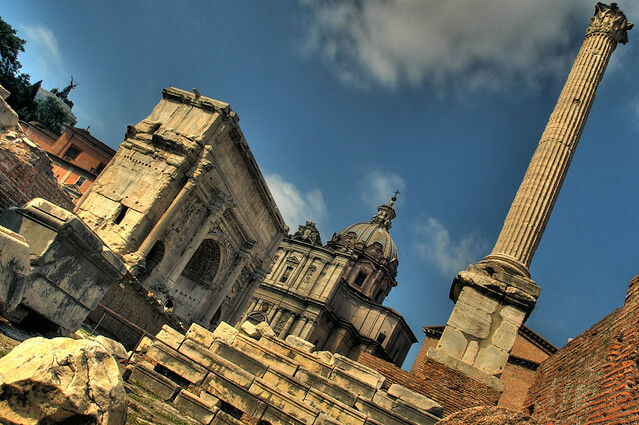 Although it means a separate admission, I would also suggest while you are here to check out the Palatine; the rumoured home of Romulus and Remus, the founders of Rome. As you can imagine there are many Hostels and Hotels in Rome. Easytobook.com offers the best hotels in Rome. I stayed very close to the Termini- it’s the perfect central location to explore the city and there are cheap eats and restaurants dotted around. Have you been to Rome? What was the best thing you did? Leave your comments below! 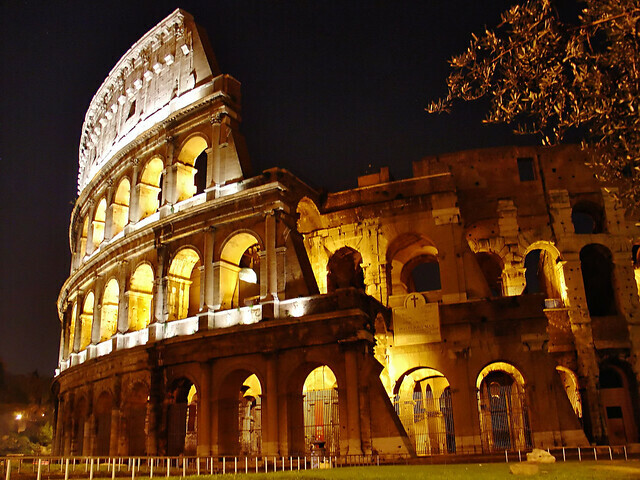 Great introduction to Rome, it’s truly one of Europe’s most fascinating cities! I also found Rome to be my favorite city with all the ancient ruins to see made it perfect for me since I enjoy that stuff. One thing I find funny thought is that you have a picture of the Sistine Chapel, when we went there I say a sign saying no photos allowed inside so I put my camera away but when I got in there must have been a thousand people in taking pictures and I thought I am not going to be the only one in here to follow the rules so I took out my camera and took a few pictures also.